A new European Union declaration could make it harder to criticize Israel as a racist state without being dubbed an anti-Semite. Politicians in Brussels on Thursday rubber-stamped the document. The move, passed by EU member states’ home affairs ministers, has already been condemned by a number of Israeli and French academics. The declaration was spearheaded by Austria, whose coalition government includes ministers who are members of a neo-Nazi party. The EU meeting that formally adopted the declaration on Thursday included several ministers from a number of right-wing parties which have encouraged anti-Jewish bigotry. Austria’s interior minister Herbert Kickl was one of them. He is from the Freedom Party, an anti-Muslim organization led by neo-Nazi Heinz-Christian Strache (now the vice-chancellor of Austria). His language seemed deliberately calculated to invoke the Holocaust – albeit this time primarily targeting Muslim asylum seekers. As long reported by The Electronic Intifada, the IHRA “working definition” was conceived as a powerful, Israel-backed method to stifle criticism of the state and its crimes against Palestinians. Israel and its lobby groups have been laying on immense pressure all over Europe in the last two years for it to be adopted. The “working definition” has been condemned by numerous Palestinian trade unions and other civil society groups, as well as by the Palestine Solidarity Campaign in the UK and trade unions from all over Europe. As the website EUobserver reported last week, Israeli embassies routinely “refer to the IHRA definition” when they file formal diplomatic complaints against EU criticisms of Israeli war crimes in Palestine. Such criticisms are toothless, considering that the EU often enables Israel’s crimes. But even that was not enough, and a great media stink was made about the party’s initial reluctance to adopt all the accompanying “examples” that that IHRA’s document claims are anti-Semitic. Several of these 11 “examples” mention Israel. Austria has already endorsed the “working definition” and, as EUobserver reported, its coalition government led the push for the declaration. Currently holding the EU’s rotating presidency, Austria had invited Israeli Prime Minister Benjamin Netanyahu to take part in a Vienna conference last month. The declaration approved by the EU was drafted during that conference, which targeted anti-Zionism. Netanyahu had agreed to attend the conference but canceled because of instability in his coalition government. This disingenuous phrase is used in the IHRA document itself. In reality though, the definition is constantly used to police speech critical of Israel. Events this year in the UK’s Labour Party illustrate that more than ever. As part of the years-long, manufactured anti-Semitism “crisis” engineered by critics of the Labour leader Jeremy Corbyn, Israel lobby groups demanded the party also adopt the IHRA’s 11 “examples” of anti-Semitism. Labour’s ruling national executive capitulated to this pressure in September. But that has only encouraged the witch-hunters, who continue trying to punish elected representatives critical of Israel. Media hysteria over the “crisis” has led to a witch hunt targeting left-wing and pro-Palestinian Labour activists. The hysteria has spilled over from the Labour Party to wider society. The “working definition” is now being used to push people out of their jobs. Paul Jonson, an employee of Dudley Council near Birmingham, was suspended from his job in October after he helped organize a protest against a local member of parliament Ian Austin – an outspoken promoter of Israeli propaganda. What was Jonson’s “crime”? Posting on Facebook the phrase “stand with Palestine, Israel is a racist endeavor” as part of his promotion of the protest. A campaigner with local Palestine solidarity groups, Jonson told The Electronic Intifada that council bosses have cited the IHRA “working definition” – which the local authority has adopted – as justification for his suspension. The council’s chief executive told a local paper in October that Jonson was under investigation. Jonson told The Electronic Intifada that the paper’s headline about his “suspension” was the first he’d heard of it. Up until then, managers had assured him he was not suspended, and they were only making preliminary discussions about a complaint received from the Campaign Against Antisemitism – a misleadingly titled anti-Palestinian propaganda group. But the same day the story was leaked to the press, managers brought him in for another meeting and then suspended him. Jonson suspects Ian Austin was behind the complaint. The MP is a patron of the group which lodged it. Local trade unionists have called for Jonson to be reinstated, as has the left-wing group Jewish Voice for Labour. A petition calling for his reinstatement has now gathered more than 600 signatures. 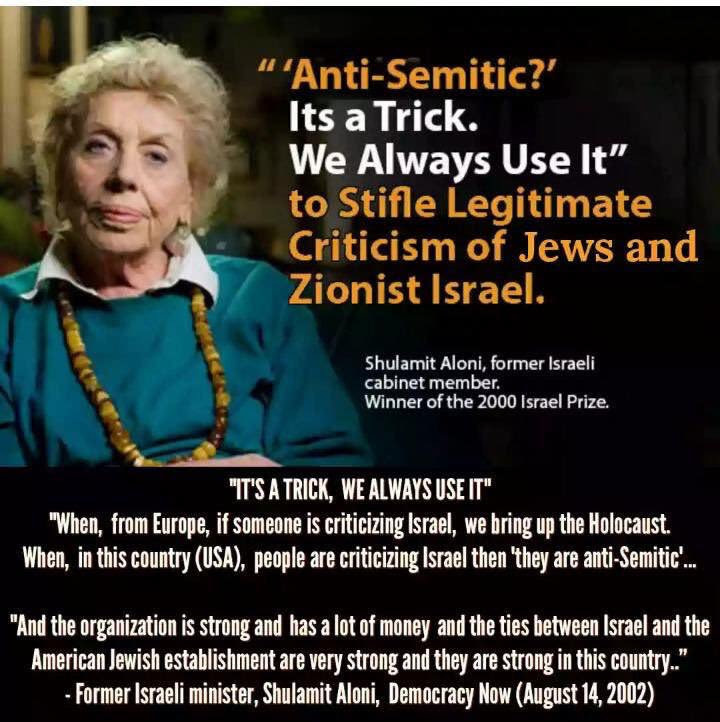 ANTI-SEMITISM IS A TRICK says Israeli minister.